We believe excellence is never an accident; it’s always the result of sincere effort, intelligent leadership, skillful execution and the vision to see obstacles as opportunities. A.L.L. Construction gives you the ability to market your product as the ‘Highest Quality’ in structural framing. At A.L.L. Construction, our focus is on accuracy. It is this accuracy that produces a clean, solid structure and allows for a smooth transition to other trades. If you are interested in using A.L.L. Construction's services, please contact us. We look forward to working with you in the future. Welcome to A.L.L. Construction, Inc., where our military (USMC) grassroots leadership naturally produces a well disciplined, highly efficient team that works together to meet and in most cases exceed our customers’ expectations. 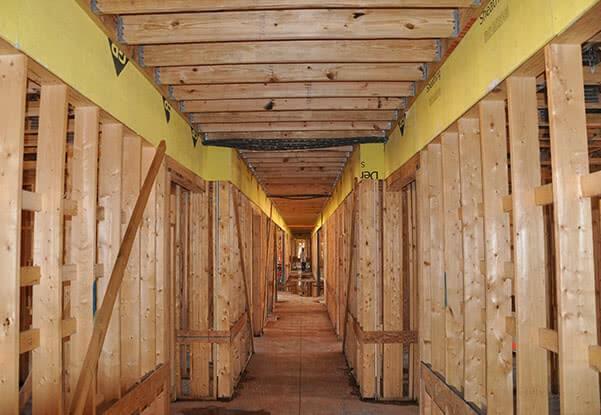 We are a comprehensive wood framing contractor specializing in commercial and residential framing. Our field supervisors have earned the respected reputation with our customers and county/state inspectors for getting the job done right! Our highly efficient production process has proven that “working smart” translates into cost savings. What you will learn as you browse our website is the evidence of an exceptional workforce. They truly are some of the finest the industry has to offer. A.L.L. Construction is the framing contractor you want! Maryland-Nat’l Capital Building Industry Assoc.